An MRI scan of a brain overlaid with an EEG of a 6-year-old child's brain during a seizure. The arrangement of electrodes on the scalp for the EEG is shown on the left. Prolonged convulsive seizures in childhood could be linked to the development of other brain conditions, a study suggests. 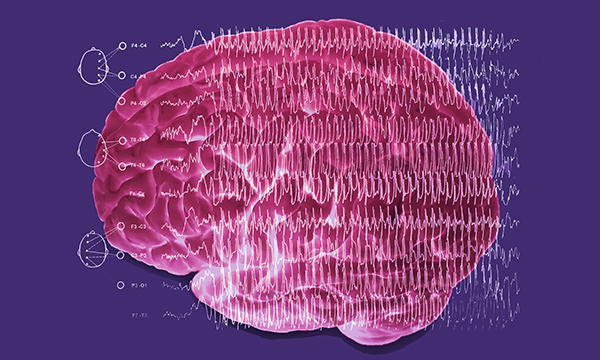 Researchers at the University of Edinburgh and University College London followed the health of more than 100 children for nine years after they had a convulsive status epilepticus (CSE) – a single or series of seizures lasting at least 30 minutes. The study found lasting neurological conditions, including epilepsy, learning disabilities and movement problems were more common for such children than those in the general population. Children who had existing neurological or developmental issues at the time of a CSE were more likely to have a neurological problem at subsequent follow-up, the researchers said. But children without existing neurological or developmental issue tended to have more positive outcomes. The researchers said the findings were important for planning long-term treatment for children whose brains may be more vulnerable to the effects of a prolonged seizure.